although easter is over, I thought I'd still celebrate the holiday this week for sepia saturday - afterall easter is a movable feast and it can happen on any date which falls between march 23 and april 25! today's first image isn't a photo, but a postcard, since it comes from my treasure box of family keepsakes I think it qualifies for sepia saturday. 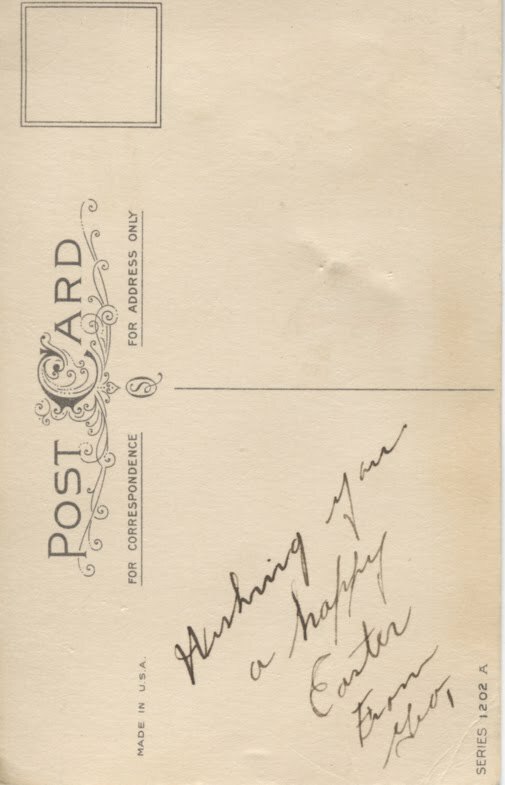 the card is signed with the simple inscription "Wishing you a happy Easter From Geo" -- the george is my paternal grandfather, george kravitz. my grandmother, mary, held on to this card for her whole life so I expect it was very special to her. without a postal mark, dating the card is just conjecture, maybe she held on to it because it was the first card george gave her before they married in 1924. 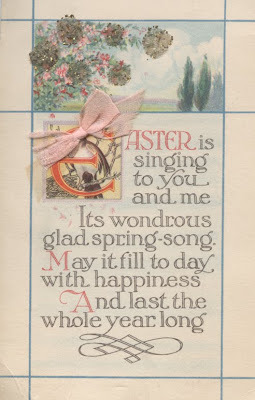 I don't think it is common for spouses to give each other greeting cards for easter, but certainly while courting, any and every holiday could be an occasion to spread cheer and good tidings. the following picture is of my other grandmother mary magdalene urinchak (on right) and her future sister-in-law and great friend, sue yanoshik. there is no inscription on the back dating the photograph, but it looks as if mary and sue are in their easter bonnets. although they are much more modern, I thought I'd add a couple photos that also capture a bygone time, even though that bygone time is my own. with the help this website, I can pinpoint the exact date this photo - april 17, 1960, not quite a half a century ago. when I was a young girl, my mother made sure we dressed up extra special for easter. for my mother and I 'dressing up' meant hats, gloves, and a fancy dress (with petticoats!! ); for my father and brother jackets and some type of tie were required items. I only remember my dad wearing a traditional long necktie; however, I remember my mom experimented with my brother and he tried out all sorts of different types of ties through the years - long ties, bow ties, and even those cheater clip ons. in this photo my brother is wearing a bolo tie. 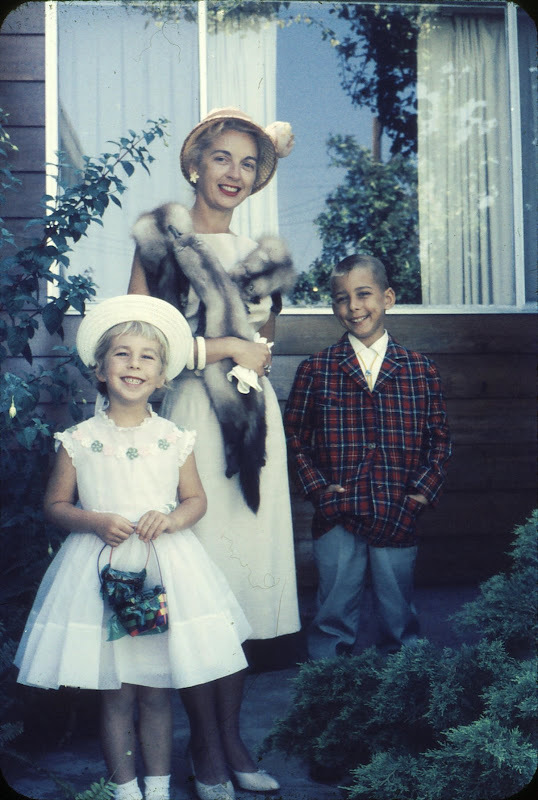 since in 1960 we were living in california, I expect my mother's fashion sense was inspired where we were! 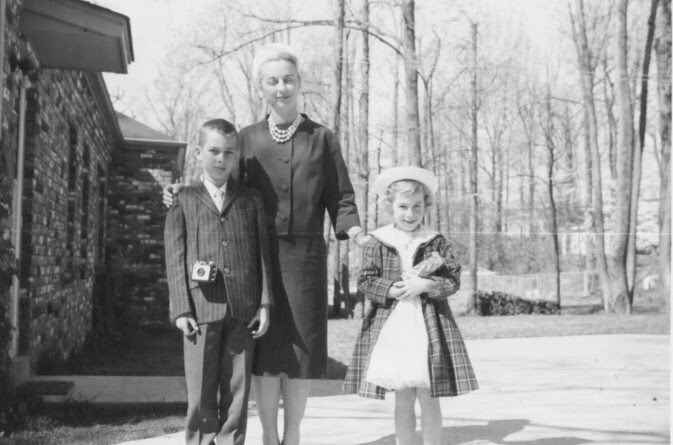 the following photo was taken on easter the following year we had moved to memphis tennessee and it seems our fashions changed with the region, although my 'bonnet' remained the same. in 1961 easter fell on april 2nd - it must have been a cold spring in 1961 as the trees are still quite bare. is that a chocolate bunny cradled so lovingly in my arms? maybe it was in 1961 that I developed my attraction to bunny ears? over time my family became much more causal about dressing up for easter sunday - by the time I was in high school I remember even wearing a pant suit to church! 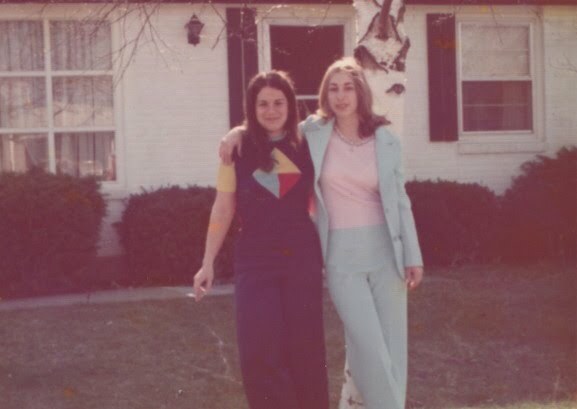 this photo wasn't actually taken on easter sunday, but it was the pantsuit I wore to church that in 1973. yes, I hate to admit it that pantsuit was made out of polyester! but it was very comfortable and as was with most all my clothes it was designed and made by my creative mother. Such pretty dresses those first two are wearing! And I love your previous post about the boxes! Fascinating look at changing fashions and attitudes over the years. Some very smart outfits on display in your photographs. I love those Edwardian clothes but can you imagine washing and ironing and starching? We have it so easy by comparison. I remember dressing up for Easter. Definitely meant the frilly dress, gloves and sometimes a hat and usually a basket of flowers and fresh eggs to leave at the altar. I imagine they were given to those less fortunate but was too young to remember. I didn't realise there were so many ways to wear a tie! Thought it was just the plain knot and a Windsor! Love the 60's photo. Although she'd be in trouble wearing that fur today! You're mother is a very elegant looking lady and you're 'well turned out' kids! That was an interesting comment on how fashions change with geography. I certainly suspect that is true. I think we are missing a lot today by not having clothing that is "special" to compliment "special occasions". What a treat, Kimy! These are wonderful Easter photos. Yes, I well remember the polyester 70s. I made most of my clothes in high school. It was the cool thing to do back then! Oh how I remember Easter dress up tome too, gloves. purses, starched petticoats. I enjoyed all your photos and comments and loved the close with Bing. Oh yes, I remember greeting polyester with immediate acquisition of same, a pantsuit. Now I don't know how I stood that--it is itchy fabric, or was it different then? Or, were we just overjoyed because it was wrinkle free, no ironing, the like? Thanks for the trip down memory lane of Easters past. Wonderful post--I love those old holiday postcards--have some in my postcard collection, but none of mine have the lovely family associations of that one. Wow--1960 really was a half a century ago! What a fun fashion parade that was! Such a beautiful family you have. It's so nice to get to know everybody"s family little by little each week. Look how cute you were with your hat and easter basket! :) Love the fur stole your mom has on! I remember we always used to get a new suit (a new dress-up dress for the girls) for Easter. I've always wondered what the history behind that tradition of new clothes for Easter was. In any case, you all look to be a well-dressed buch, even with the pantsuit. Kimy - I was always dressed to the nines for Easter Sunday too. All the pictures are lovely, but I cracked up at the 1973 one of you in your polyester pant-suit. I had one of those too, but I was about 12 years old! I remember those clothes with great fondness. The top photo is such a beauty! My what a nostalgic, poignant trip down memory lane. You have lovingly told your Easter story through the years, mixing the early Easter card (and I bet you are right, a 'first card' from her admirer. And I can relate so much to your descriptions and events of family Easter gatherings. I remember the new patent leather shiney shoes I would get for my Easter outfit; and the bonnets! Yes, we dressed differently 'back then', more proper... but I too had a blue polyester pantsuit in the early 70's, unfortunately that was what I was wearing for my freshmen year class picture. But yikes, your mom is wearing an animal (there is a previous Sepia I commented on about these pelts that were so fashionable). My great great Aunts would don these little minks or fox, with all there features still intact... beady eyes, claws, the mouth used as a clasp that grabbed the tail to close the stole around your shoulders. Thank goodness they have gone out of style! I was shocked when we cleaned out trunks of fur coats and stoles left behind from another era, it was like boxes full of dead animals to me! 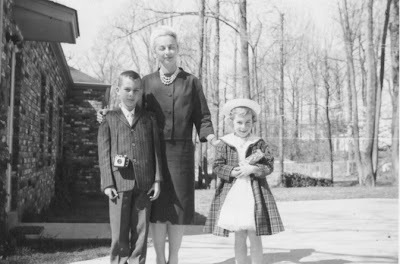 Your mom certainly is stylish, so very 'fifties', you look so thrilled (I remember the Easter pocketbook too that was a must have for the new outfit). Love the bolo on your brother! I probably have a similar family picture of myself in my Easter finest! Thanks for sharing. Great photos. Your mom reminds me of myself. We married in 1960 and of course at that time we had to wear a hat to church (Catholic). I made all my 4 daughters clothes but never could manage the boys except for little elastic waisted shorts. The top photo is very exquisite. Your grandmother's name was Mary Magdalene? You don't get much more Easter than that. Love the gloves, love the hats but especially love the polyester pantsuit. what a great sequence of pictures - you were such a cutie! I remember gloves especially as part of "Sunday best"
Great photos and cards, both the sepia and "recent" (half century ago!) color ones. It is hard to fathom, though, how that sweetly smiling bonneted girl from 1960 could grow up into someone who spouts such vicious lies about 1960 being half a century ago. Really! That is absurd. If 1960 is half a century ago, that would mean that 1985, the year I finally graduated with my mathematics degree (that's right — a math degree, here I am pulling rank on you in the counting game), would be a quarter century ago. And that just makes no sense at all. What a great blog. I really enjoyed seeing the 1960 is like a tv show on the screen. Thanks for sharing all your neat photos. The photo of you, your mother and brother is reminiscent of the photos I have. 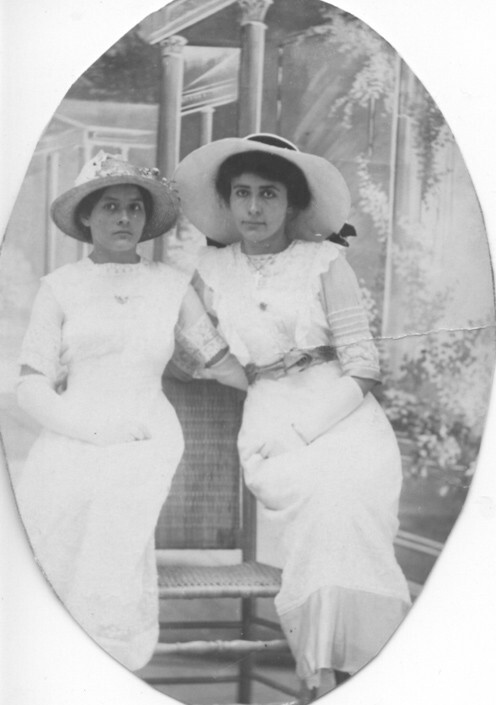 My mother also bought us a new outfit each year and we wore hats and white gloves. My brother also wore a tie and when he was little, he wore short pants. So darn cute. Your first photo taken in California, resonates as I was born and raised there and Easter was always a sunny warm day no matter the day. I have so many great photos from those Easters. Some day I'll start scanning and posting, I swear. Your clip from "Holiday Inn", one of my all time favorite Christmas movies, is sweet. Where did you find that particular little bit? Clever. As always, wonderful, wonderful photographs. And they provide a photographic tour of styles. The dates of Easter remind me of one of my very early jobs which was forward planning school holidays for schools in London. As terms were always based around Easter holidays. knowing the date of Easter well in advance was always an imprtant part of the planning process. wonderful Photos.Look Smart!The Good Thing about Cold Easters is that The Choc Bunnies Dont melt! kim, your face, your smile, they haven't changed a bit! you're lit by the same light then and now. lovely pictures. lovely post.